For any one who doubted Ron Howard's 'commitment to Sparkle Motion', read this..
We recently wrote about how the Force was strong with Ron Howard in light of his forth coming role as the Knight in Battle Tested Armour to 'fix' whatever became of the Han Solo movie. 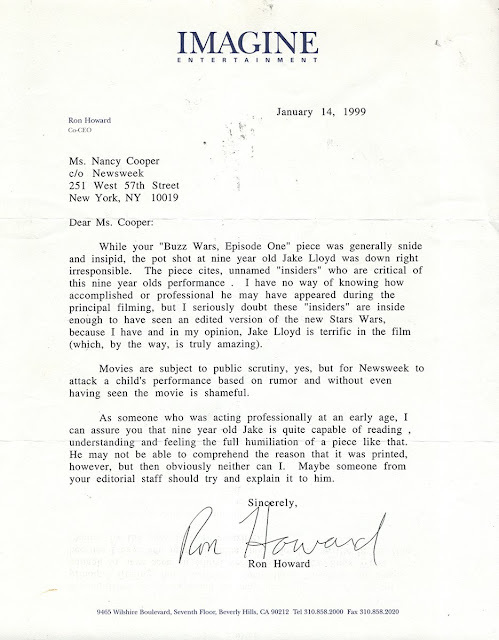 We're not sure when this letter was made public but it's doing the rounds in light of Howard taking on the director duties. If anyone doubted that Ron is one with the Force and the Force is one with him, and that he had no commitment to Sparkle Motion check out his defense of the young Jake Lloyd in his letter to Nancy Cooper of Newsweek in 1999. We asked Nancy Cooper her thoughts on The Letter.